Jade Helm 15 — An unprecedented and unlawful military exercise on U.S. soil occurring in those states that are most affected by out-of-control illegal immigration. There is no other border in the G20 world that is as porous as the southwest American border. Not only is it porous, the U.S. Federal Government has actively encouraged illegal aliens from Central and South America to enter through what is practically now an open border. Why has the government deliberately failed to enforce immigration law? Even to the point where the Obama Administration has taken to political prosecutions — Texas and Arizona — of those states that are vociferous about the flagrant lack of border security and immigration law enforcement. Is Jade Helm 15 a means of intimidating these and contiguous states to go along with the new lawless regime? What are the many other serious implications of this unparalleled deployment of American troops on U.S. soil? The following article is an important one for every American citizen to deeply contemplate. Perhaps it can be used as a means to prevent the illicit Jade Helm exercise from taking place anywhere in 50 states. is coming to a state near you! People all over America are wondering what the true purpose of Jade Helm is, whether it is linked to coming emergencies or catastrophes, and whether it is being used to condition the public to accept military intrusion in their lives (or a possible marital law scenario). The US military and mainstream media are downplaying its significance, yet a closer examination reveals there is valid cause for concern. Jade Helm 15 is a military exercise slated to occur from July 15, 2015 until September 15, 2015. It was initially scheduled for 7 states (California, Nevada, Arizona, Colorado, New Mexico, Utah and Texas), but now includes 3 more states (Louisiana, Mississippi and Florida). For the first time ever, it will feature American soldiers actively practicing on American soil and American streets – especially on streets, since this operation focuses on urban warfare. These won’t be just any old American soldiers, but the cream of the crop, composed of Green Beret, Navy Seal and other elite forces. According to the US Military, their mission will be to operate undetected amongst the American civilian population, wearing civilian clothes and driving civilian vehicles, and practice UW (Unconventional Warfare) techniques in terrain resembling the Middle East so as to better fight enemies over there. At least, that is the cover story. The Posse Comitatus Act was passed in 1878, and it forbade the US military from being deployed domestically on American soil. The purpose of Posse Comitatus was to prevent a tyrant from seizing power and directing the nation’s standing armies against its own people. This kind of thing has happened throughout history; military generals like Julius Caesar and Pompey overtook the Roman Republic by marching upon the city of Rome with their armies. Posse Comitatus is very important plank in a free society, because it is another way to prevent centralization of power and keep the different functions and powers of Government as separate as possible. Jade Helm looks like another step in the direction of domestic military deployment – a nail in the coffin for a free republic. The supposed basis of Jade Helm is that the US military needs to practice in the same kind of terrain as its Middle Eastern enemies. Since the Middle East is full of different countries whose attitudes towards the US range from hostile to neutral to friendly, the US military has designated certain US states as hostile, to mimic these Middle Eastern countries. 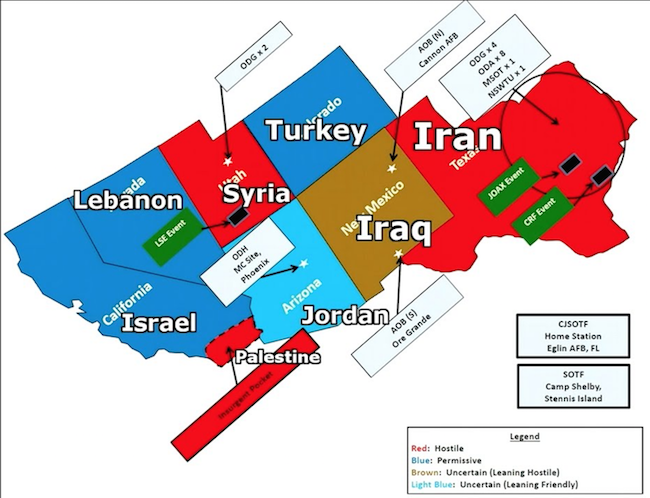 When you overlay a Middle Eastern map over the southwest USA, Texas is roughly comparable to Iran, Utah is roughly comparable to Syria and the “insurgent pocket” of California is roughly comparable to Palestine. Thus these 3 areas have been declared hostile for the purposes of Jade Helm. From a civilian perspective, declaring certain states hostile is a real cause for concern. Texas has a culture of fierce independence and resistance to federal control. Is it just a coincidence that Texas is 1 of the 2 states fully designated as “hostile” in Jade Helm? Is it just a coincidence that Texas just passed legislation to build its own gold bullion depository in order to repatriate $1 billion worth of gold currently stored by the Federal Reserve in New York? Is it just a coincidence that Texas is the state labeled as “hostile” when it’s home to a massive number of gun owners, patriots, secessionists and liberty lovers who would fight the Federal Government to the death? Even if you take everything the US Military is saying at face value – a big jump I know – and even if you believe that the declaration of certain states as “hostile” is completely innocuous, standard and has no deeper meaning, what are the implications for war? The US has already raised the ire of almost the entire world by its constant invasions, bombings, incursions, drone attacks and assassinations in the Middle East. It has made countless enemies since 9/11 by attempting to conquer that entire region. It has murdered millions of Middle Easteners and has stolen tons of oil and other natural resources from the land. But apparently this is not enough. Now, the NWO elite want to continue using the US military, which is essentially their private army of killers and assassins, to further obliterate Syria and Iran to dominate the entire region – with an eye to encircling Russia and China. Do we really want to ignore or condone the US military training to accomplish its mission of unbridled aggression? The widespread exposure of Jade Helm has led many to predict that it will lead to martial law. Whether this is an accurate prediction or fear-based prophesizing remains to be seen, however one thing is for sure: even if the exercise does not produce martial law, it is definitely conditioning the American public to accept and become accustomed to an increased police/military presence in their lives. Jade Helm is the elite sending a message to the general US population: get used to living in fear. Get used to living in a world where it is normal for the military to patrol among your ranks, disguised or out in the open. Get used to being watched closely. Get used to the sight and sound of military being deployed in your town. Welcome to New World Order America. The problem here is the military mindset – the mindset that divides the world up into friendly and hostile, and that is always training to defend itself and attack “the enemy”, even though that enemy is frequently imaginary. Just look at how many enemies our leaders have given us, from the Nazis to the Commies to the Islamic terrorists, when in all cases those enemies were created and funded by the US military-industrial complex and the NWO elite. Jade Helm is a continuation of the demented and delusional mindset that seeks to find an enemy to fight in any situation. Citizen journalists have caught copious video footage of military vehicle movements around America in the last few months. Is it just a coincidence that some of this is happening in Jade Helm states, such as California, Nevada andTexas? The mystery of the abrupt closings of 5 Walmarts in Jade Helm states has not been solved, but many have theorized that it is connected to Jade Helm. Is Walmart, which is already enmeshed with the Federal Government and DHS, linking itself to underground tunnels? Is Walmart setting itself up to become a military command center? If not, then why is military equipment being parked in Walmart parking lots all over America? – the testimony of various military officers, active and retired, who have revealed that the DHS is attempting to build a domestic army (e.g. thisMarine Colonel). Hopefully a critical mass of awakened Americans can use Jade Helm as a wake-up call. The deeper implications reveal a great cause for concern. As always, the people have the power. If enough people take interest and oppose this operation, it may have to cancelled, or its effect will at least be nullified.